Thai food has never really appealed to me. Despite a lot of praise from friends I was always skeptical. 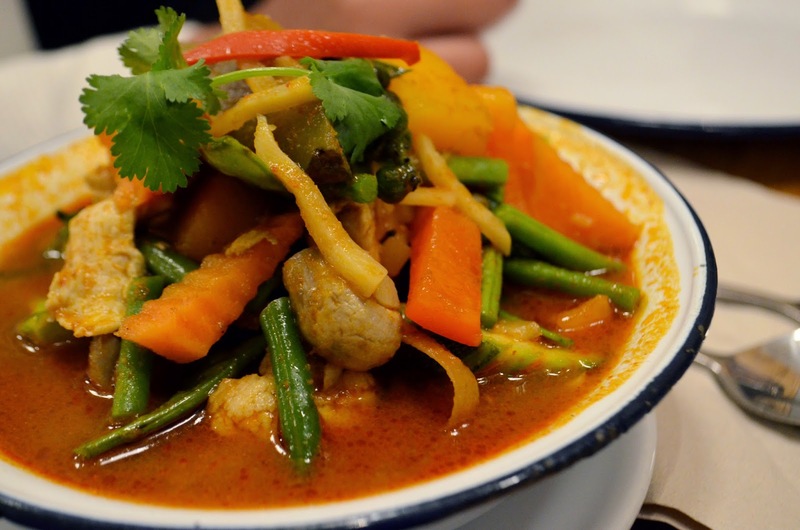 I find that most Asians (that I know) aren’t fond of Thai, I reckon most of us find it hard to grasp the fact that their curries aren’t like the average jalfrezi. Still, this weekend I thought I’d be all daring, (yes, look at me!) and agreed to try it. Mostly because we were running out of time and also due to the fact that I was starving so I would probably have eaten a scabby horse if it had been cooked within the next ten minutes! 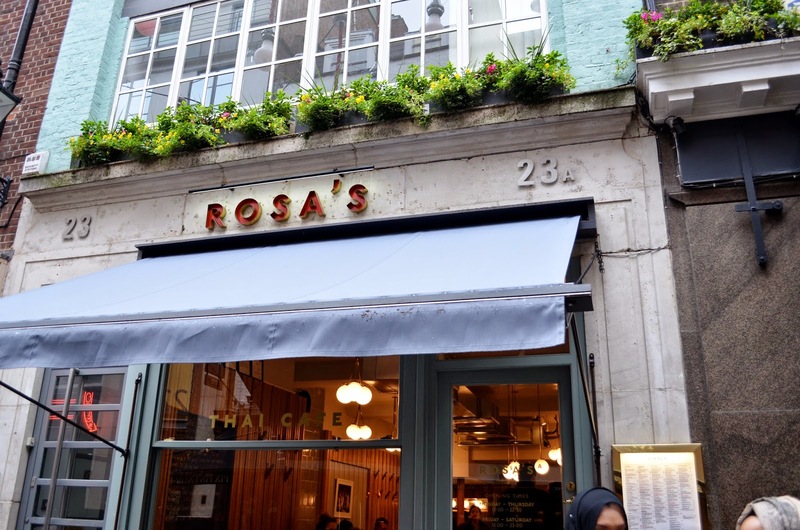 I’d heard lots about Rosa’s, particularly when I worked in Central London. Let me rephrase that, I have heard nothing but good things about Rosa’s. It was often recommended for a quick lunchtime fix, but again, you know…it’s thai food…so I never visited. We got there during the busy lunchtime rush and from the outside it was a nondescript cafe. Inside, the decor was simple with the seating is on low stools mostly. It can get slightly cramped when it’s busy but I suppose that’s expected for a small cafe style restaurant off Carnaby street. The ambience was laid-back and low key, very hipster without the pretentiousness. I loved it. The place was pretty full when we got there however we were lucky enough to nab a table as soon as we got in. The food gets served up pretty quickly so we weren’t waiting for too long, it took us longer to decide what to order because of their extensive menu! They had pretty much anything you could want, including, venison, duck & even lobster. Best of all the chicken was halal so that opened up even more options for me. 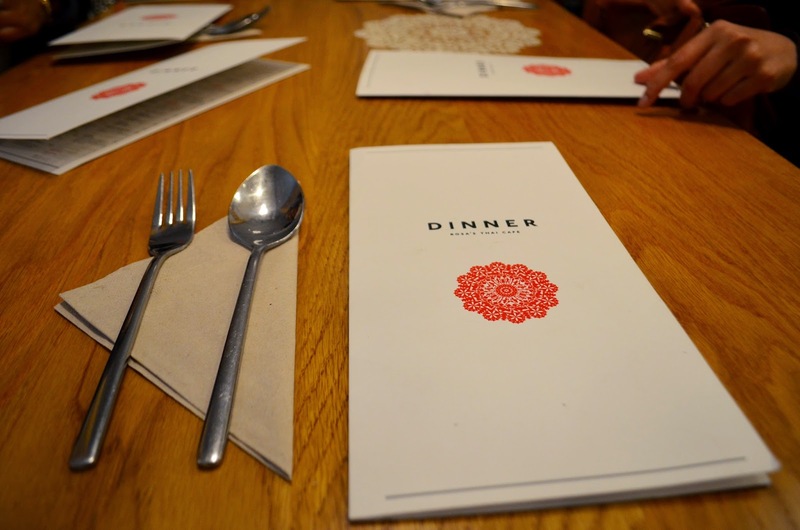 Rosa’s lengthy menu promises “authentic fresh Thai food with a modern twist” and that sums up pretty much every dish available on the menu. In the end we ordered a mixture of noodles and rice to accompany our Jungle curries, Chicken and Cashew curry, Pad Thai and Tom Yam soup. They were nice enough to put some chicken in the vegetable Jungle curry, which I ordered and if it wasn’t so filling, I would’ve definitely eaten it all. Unlike the Westfield branch, you do have to order noodles or rice to eat your mains with so remember that when you’re ordering. The portions are a nice size, the food flavourful and the atmosphere is just perfect for a casual meet up or quick hunger fix. The waitress’ were pretty friendly however it was pretty busy so the Tom Yam soup did turn up when we’d nearly finished all the other dishes. Still, whenever we asked them for anything (knives, straws) they were happy to help. It even turns out that film stars like Keira Knightley is a regular to Rosa’s. I was convinced the lady on the next table over was a model too. Says it all really, Rosa’s is a fabulous little Thai find in Soho. for quick, filling hearty food. Have you ever been? 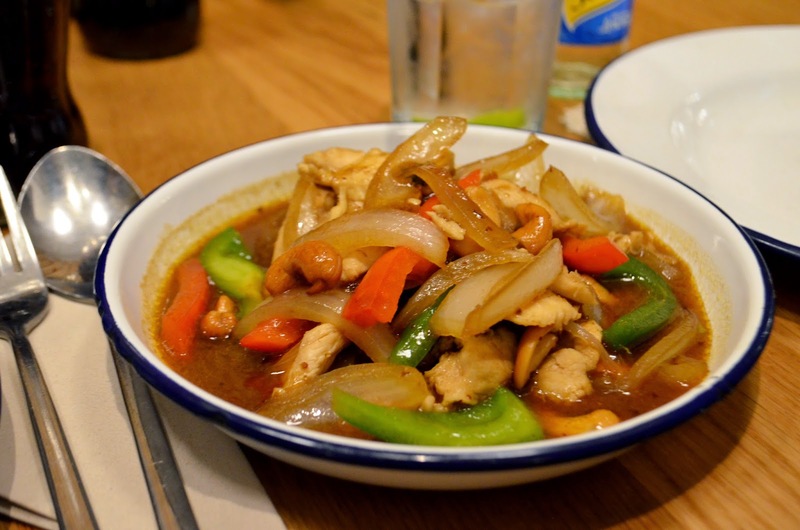 What’s your take on Thai food?